Like many state architects, Alfred Eichler’s name is not widely known, yet the public structures he designed in his nearly four decades in the Architecture Division of the California Department of Public Works reflect the everyday lives of many Californians – schools, hospitals, office buildings, prisons, border inspection stations, bridges, historic restoration projects, and state parks and fairgrounds. 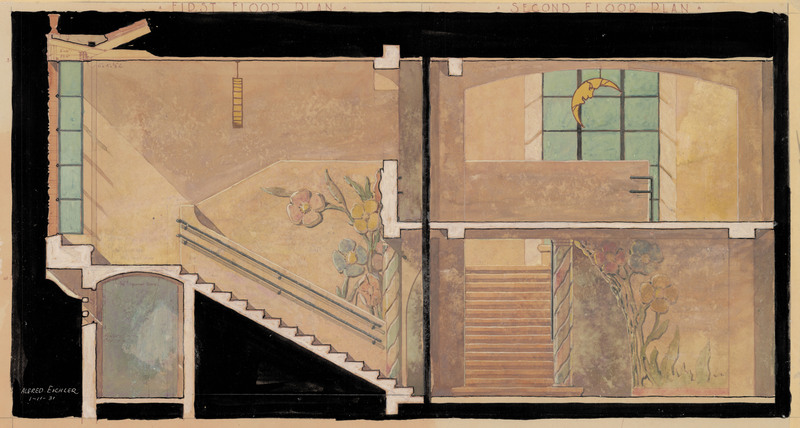 The Alfred Eichler Collection (Identification # F3274) contains 431 images, comprising architectural drawings, sketches, and watercolor paintings Eichler created from 1925-1962. 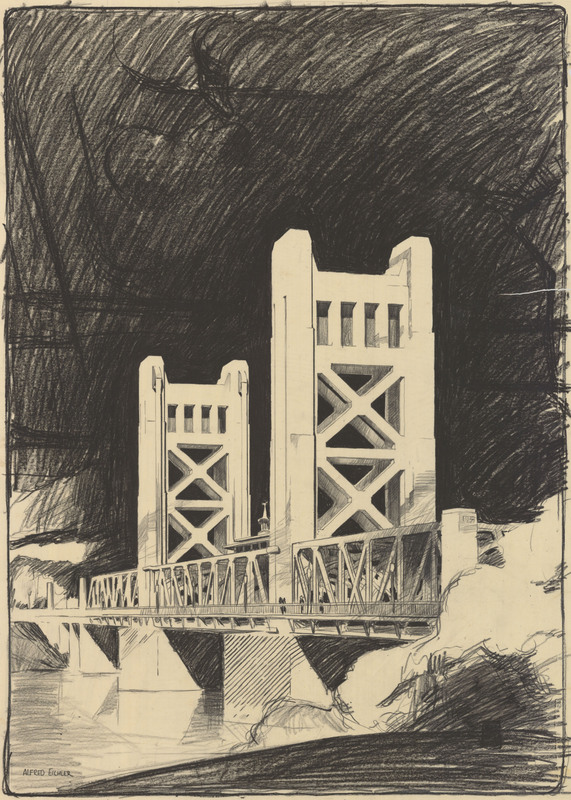 Among the designs and drawings are public projects including San Quentin and Folsom Prisons, Sacramento’s Tower Bridge, state fairgrounds, Stockton and Napa state hospitals, the School for the Deaf in Berkeley, state universities and office buildings, the Benicia State Capitol restoration, the Yountville Veterans Home, and others. 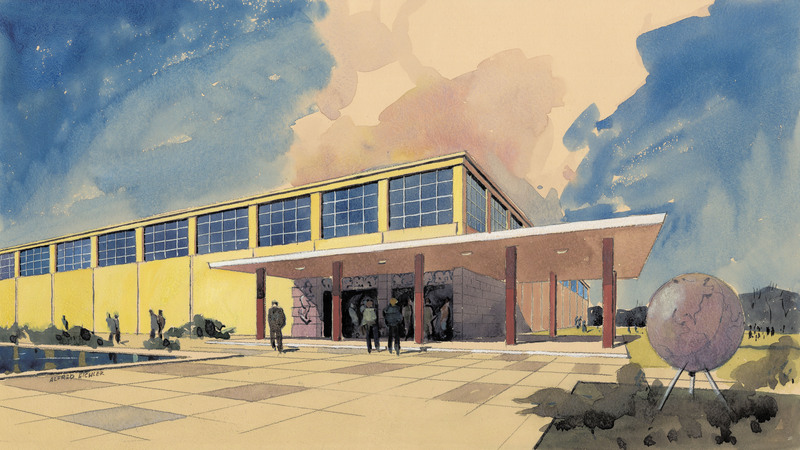 In addition to his architectural skills, Eichler was an accomplished artist who utilized a variety of styles and art media to create these pieces. Each one is an example of the Golden State’s efforts to address the needs of a diverse and growing population through public projects. Architect Alfred William Eichler (1895-1977) grew up in San Francisco and was trained at Columbia University and the Beaux Arts Institute of Design in New York. He went on to serve as a civilian architect for the U.S. Navy during WWI. Eichler then worked for private architectural firms in Washington D.C., New York, and San Francisco, before being hired in 1925 as a Senior Architectural Designer for California’s Department of Public Works. Promoted to Supervisory Architect in 1949, Eichler oversaw the Design Section of the Architecture Division until his retirement on November 8, 1963. You can browse the entire collection or use the search tool to look for specific images. Be sure to select the Alfred Eichler Collection in the "Search by Collection" box. 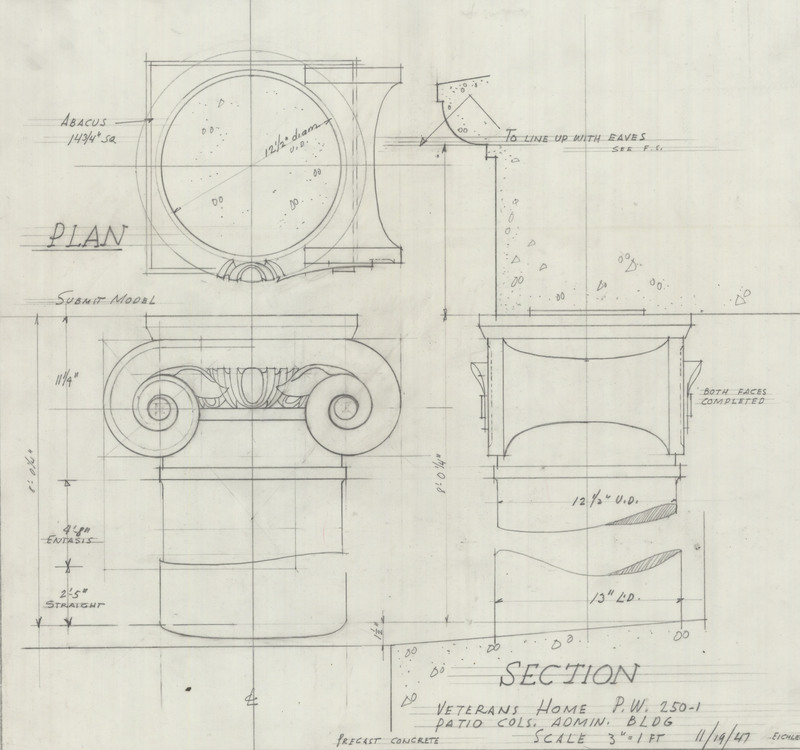 The images in the collection are drawn from the records of the Architecture Division of the Department of Public Works, housed at the California State Archives. The entire collection was digitized by the State Archives' Imaging Department. To request a high-resolution scan of one or more of these images, contact the California State Archives via email or call the Reference Desk at (916) 653-2246. Please include the Title or Identifier for each photograph in which you are interested, as well as the desired format (tiff, jpg, pdf) and resolution (DPI) for the requested scan. Duplication fees will apply. You can browse the entire collection or use the search tool to look for specific images. Be sure to select the Eichler Collection in the "Search by Collection" box. The images and content may be used for personal use, research, or educational purposes. For any use of these materials, please credit the California State Archives, Alfred Eichler Collection, Identification # F3274. Commercial use or distribution of the images or content is not permitted without prior written permission from the California State Archives. Please note that the materials contained in this collection may include copyrighted material not held by the California State Archives. Additionally, other limitations, such as the right of publicity, may limit use of the materials in this collection. For more information about the rights related to this collection or to request permission to use the digital images or content, please contact the California State Archives via email or call the Reference Desk at (916) 653-2246.